To avoid financial loss, consider safer alternatives to paper stock certificates. 3. Can a Lost Stock Certificate Be Replaced? The quick answer is yes. Lost, stolen or destroyed stock certificates are payable if you replace them -- but you’ll have to act quickly to get a duplicate before someone else can also claim ownership. The process is likely to cost you some money, and it will be easier to navigate through it if you prepare ahead before it ever happens. Contact the transfer agent who handled your stock purchase as soon as you know your certificate is lost. The transfer agent is the intermediary firm between you and the company issuing the stocks. The issuer contracts with the transfer agent to manage its shareholder records, record ownership transfers, issue and cancel stock certificates, and distribute dividends. The transfer agent can also put a "stop transfer" order on the stock certificate to keep ownership from being transferred to someone else. In addition, the agent can issue a replacement certificate. If you don’t know what firm acted as the transfer agent for your purchase, contact the stock issuer’s investment relations department to find out. If you later find the certificate, ask the transfer agency to cancel the "stop transfer" so you can sell the shares without problems. According to the Securities and Exchange Commission, the share issuer requires a report explaining how you lost the stock certificate. In addition, you have to provide a notarized affidavit that describes the stocks, including number of shares, their par value and type the day they were issued, and the name and type of company that issued them. The document should also detail the steps you took to try to recover the certificates, and whether they had been endorsed by your signature, stock power or another means before being lost. You have to act quickly to obtain a duplicate stock certificate before someone acquires the lost one as an innocent purchaser. The term refers to a buyer who obtains property ownership in good faith, unaware of existing legal issues to prevent the transaction. This can occur if an innocent purchaser buys your certificate from someone who found it and passed it off as his. Because of the risk of dual ownership, the company issuing the shares requires you to buy an indemnity bond to protect it and the transfer agent from loss if both you and an innocent purchaser sell back the same stock shares. According to the SEC, you must buy a bond worth 2 percent to 3 percent of the lost stocks' market value. 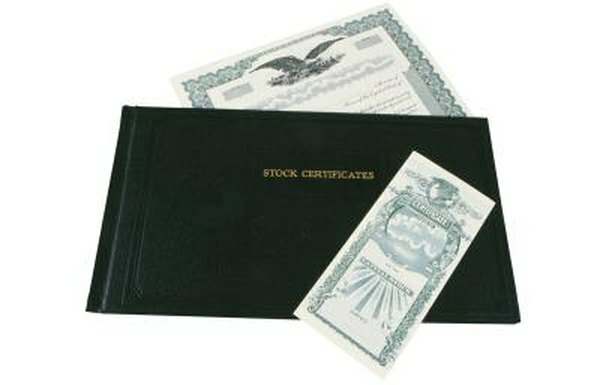 The best thing you can do to protect yourself in case you lose your stock certificates is to copy them, front and back. File the copies separately from the original. If by the time you reach the transfer agent, the firm has processed an ownership change, the certificate numbers on the copies will be valuable information not only to prove your original ownership. The agency can also use the numbers to track the transfer, find out when it occurred and identify the new owner.